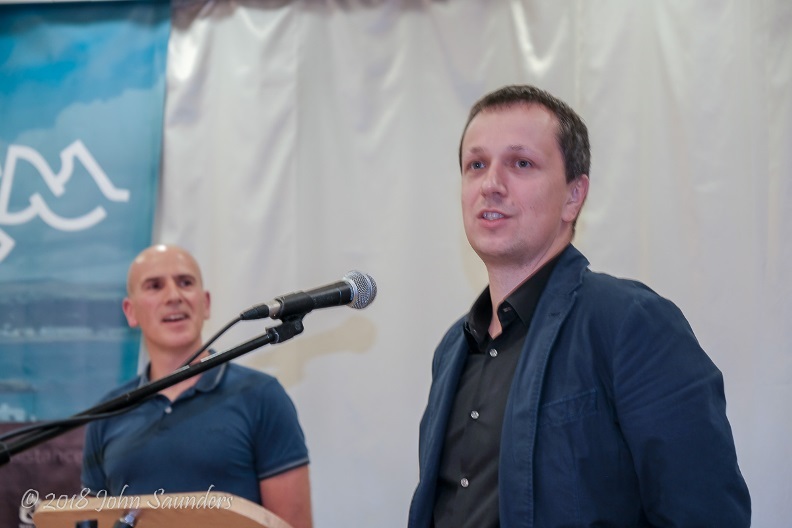 Husband and wife team Radek Wojtaszek and Alina Kashlinskaya triumphed in the Chess.com Isle of Man International. Radek drew with Arkadij Naiditsch to take a £37,500 share of the 1st and 2nd prizes and then won the blitz tiebreaker in Armageddon to take another £500 and the trophy. 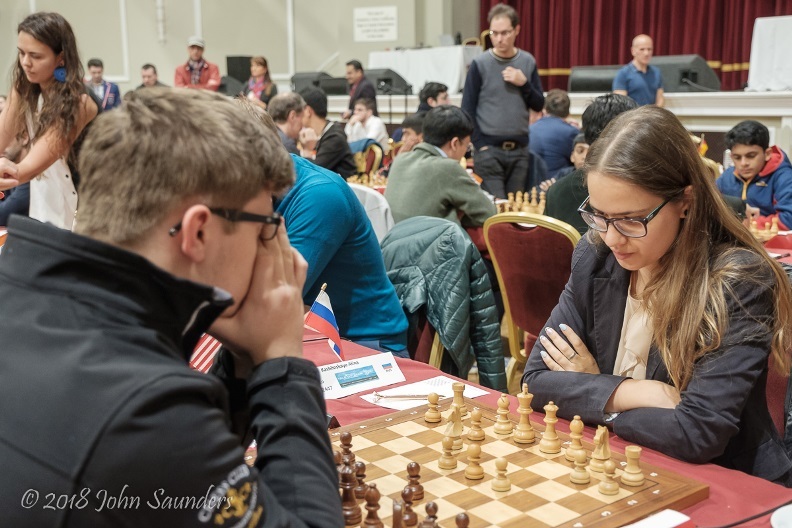 Alina meanwhile beat Sam Sevian on her 25th birthday, claiming her 1st grandmaster norm and the £7,000 women’s top prize – more than was earned by the 7 players in the tie for overall 3rd place. 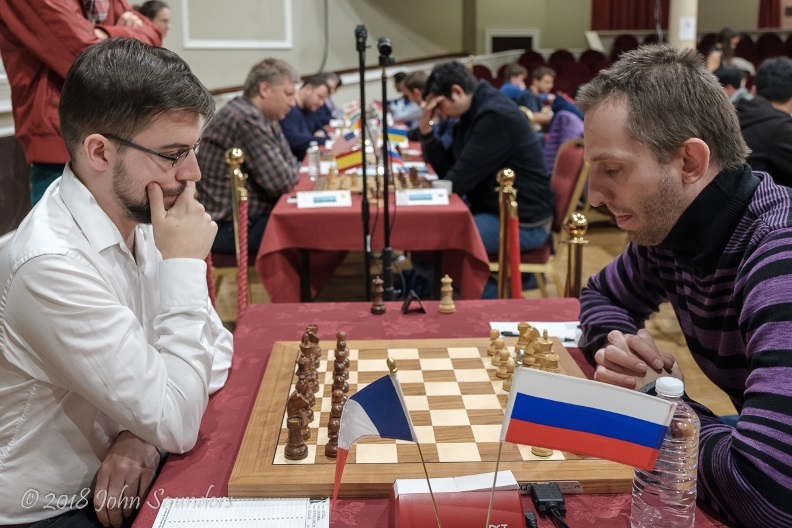 Those included Alexander Grischuk, who beat MVL for the 1st time in the tournament’s only world Top 15 clash. Going into the final round the temptation for Radek Wojtaszek and Arkadij Naiditsch to play for a draw was verging on overwhelming. After their wins over Mickey Adams and Hikaru Nakamura in the previous round they had a half-point lead over the 4-player chasing pack and knew that a draw would at worst mean a 5-way tie for first. As the top prizes drop precipitously from £50,000 for 1st to £25,000 for 2nd, £12,500 for 3rd and £7,500 for 4th (then £6,250 for 5th) that meant at worst a draw would mean a £20,250 payday each, while at best – and this is what happened – it would mean £37,500 each. Naiditsch thought for 29 minutes here about ways he could try for more (although White can play on, objectively the position is a draw), but in the end he decided to force a draw with 25.Qxf6 Rfe8 26.Qg5+ Kf8 27.Qh6+ and so on. That already meant it had been a good day for both players, but as the hours went by it would get better and better, especially for Wojtaszek. If one of the players in the chasing pack had won it was Radek who would have missed out on the playoff, but instead he took the £37,500 share of the top two prizes and also got to play for the trophy and an additional £500 bonus. 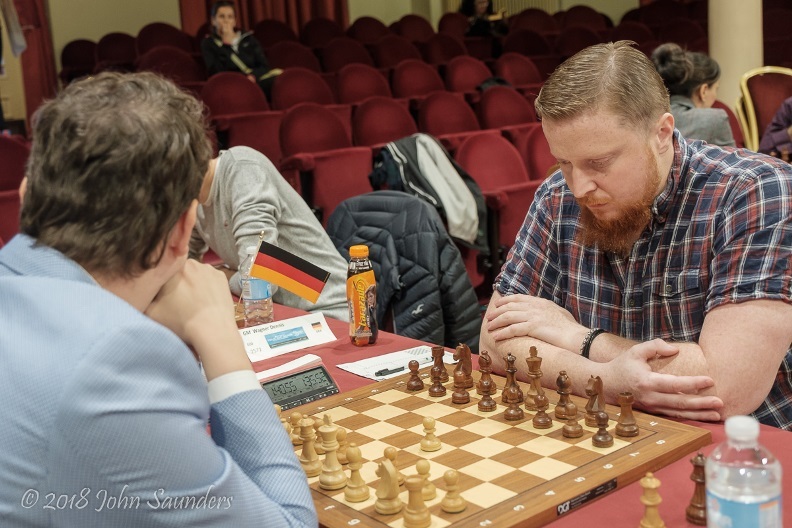 The players seemed to struggle to adapt to the fast time control after 9 days of classical chess, and in the first game, playing White, Radek blundered a pawn in the opening. Up to a point it seemed Naiditsch was going to go on to convert smoothly, but then he allowed White to open up his king and all hell broke loose. 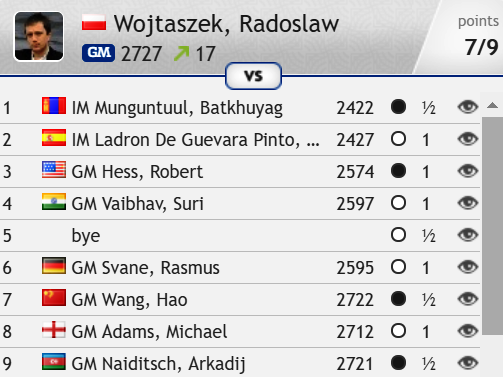 The advantage swung from side to side until finally Wojtaszek had the last laugh after 48…Kg4? 49.Rd4! turned the tables, but Black could still have forced a draw after 49…Re2! Instead Arkadij played 49…Kf3 and Radek gratefully took the queen and won a few moves later. I think in a playoff it actually matters who wants it more, and I think I was simply the guy! That meant that Wojtaszek had scored perhaps the biggest triumph of his career, with victory in the 2017 Dortmund supertournament the only real competition. He’d also taken his live rating to 2749.4, a fraction short of his peak rating, making him the world no. 16, a place above Hikaru Nakamura. It’s not unheard of for Alina and Radek to win tournaments together, since they did so the first time they met back in 2011! I know that playing on your birthday is risky… I can’t say that it was easy, but all my moves were so natural and I just wanted to push! That meant a 2705 performance for Alina and the £7,000 women’s first prize, more than the £5,607 taken home by the 7 players tied for 3rd place, and much more than the £184 earned by the other 18 players who scored 6/9 for a share of 10th place. 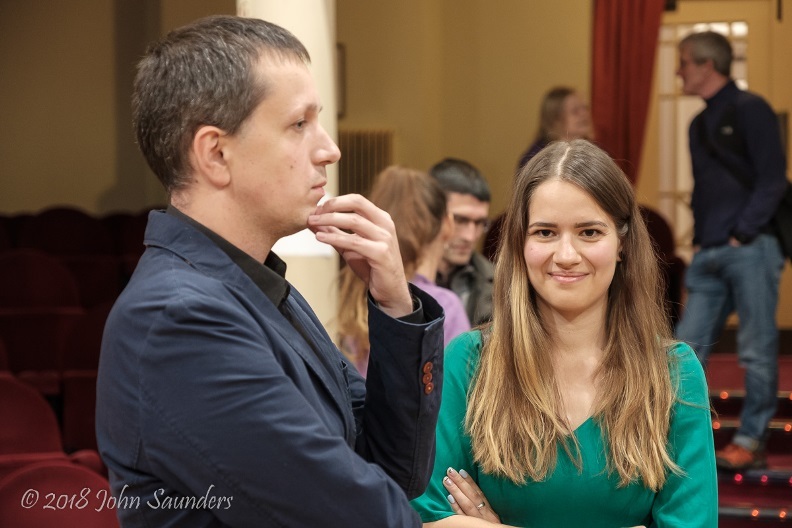 Alexandra Kosteniuk took the £3,500 2nd women’s prize for 5.5/9 after beating Indian GM Sundararajan in a tricky ending that lasted until move 98. That was the last classical game of the tournament to finish and may have brought back painful memories for Alexandra, who lost the last game of the Batumi Olympiad. Instead it was an important win, since it meant she didn’t have to share 2nd place with Pia Cramling. 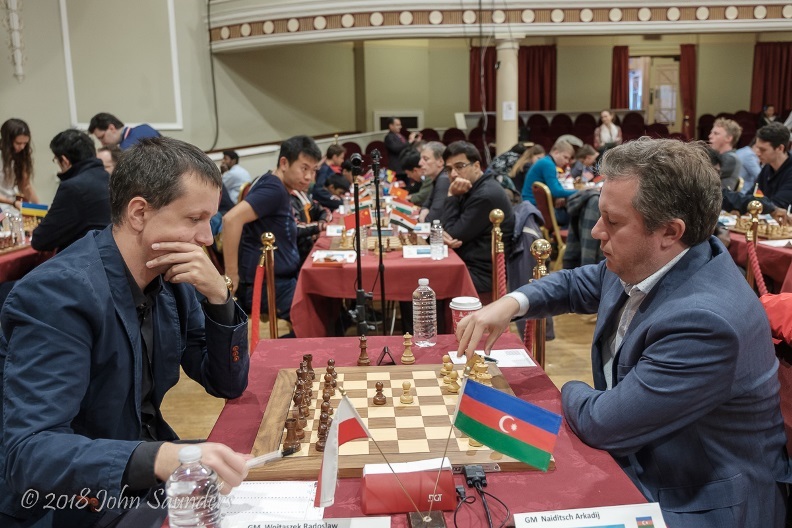 For most of the day the question was whether any of the other players on 6/8 could win and join Wojtaszek and Naiditsch, but although Jeffery Xiong and Wang Hao pressed with the white pieces against Gawain Jones and Vishy Anand they couldn’t break through. Maxime Vachier-Lagrave was the only world Top 15 player in with a chance of the title in the final round, but he was unlucky to be paired with Black against Alexander Grischuk. It’s like making a 100m distance in cycling, or 1 km in Formula 1! No doubt it was partly just coincidence this year, but in any case, the only “top” pairing of the tournament was a fascinating one, with both players approaching it with the aggression their tournament standing required. The Sicilian Najdorf was dynamically balanced all the way until what Grischuk described as, “the first mistake I’m aware of in the game”, 38…Re6?! Grischuk explained that had been the first decisive game between the two players, and also got to make up for lost time in front of the camera! Everything’s so politically correct… and then you have the Isle of “Man” – it’s an amazing feeling to be here! 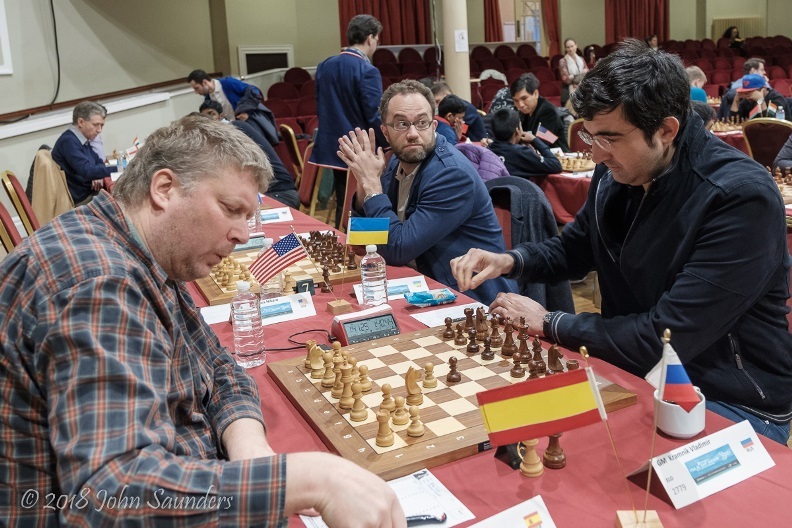 The win took him into a share of third place level with Vladimir Kramnik, who beat Alexei Shirov in the final round, Hikaru Nakamura, who beat Pavel Eljanov, Adhiban, who beat Mickey Adams, and Wang Hao, Gawain Jones and Jeffery Xiong, who all drew. Of course as always more happened on the final day than it would be possible to summarise. For instance, 13-year-old Vincent Keymer will have to wait for the grandmaster title after he failed to get the draw he needed against Emil Sutovsky. Other prodigies also suffered, with Praggnanandhaa lost against Le Quang Liem by move 15 while Gukesh also lost to Zoltan Almasi. They were sitting together, as was Nihal Sarin, who managed to draw against Wesley So in nerve-wracking mutual time trouble. 35.Rxf7!, and Short resigned, since 35…Rxf7 36.Rxf7 Qxf7 loses to 37.Qxg5+!, picking up the d8-rook. The game finally ended in mate on move 37. One of the stars of the event, Abhijeet “Superman” Gupta, followed beating two 2700 players in consecutive rounds with three losses in his final four games. He has the right attitude, though! So that’s all for this year’s Chess.com Isle of Man International! Coming up in 11 days is the Carlsen-Caruana World Championship match in London, and our commentary team will feature the most star power we’ve ever assembled. Talking of which, what will Carlsen’s latest challenger cook up? But first there are, of course, more top level events. On the 3rd November in Khanty-Mansiysk the 64-player Women’s World Championship knockout will start, with Alina Kashlinskaya facing a tricky 1st round tie against the even trickier to name 19-year-old WGM Gulrukhbegim Tokhirjonova from Uzbekistan. The status of that event has grown now that it’s been decided that not only will the winner become the Women’s World Champion but the remaining semi-finalists will qualify for a Women’s Candidates Tournament. A day later Radek Wojtaszek will be in action in China as he plays in the 2nd edition of the Shenzhen Masters alongside Ding Liren, Maxime Vachier-Lagrave, Anish Giri, Yu Yangyi and Nikita Vitiugov. Of course you can watch all the action here on chess24!